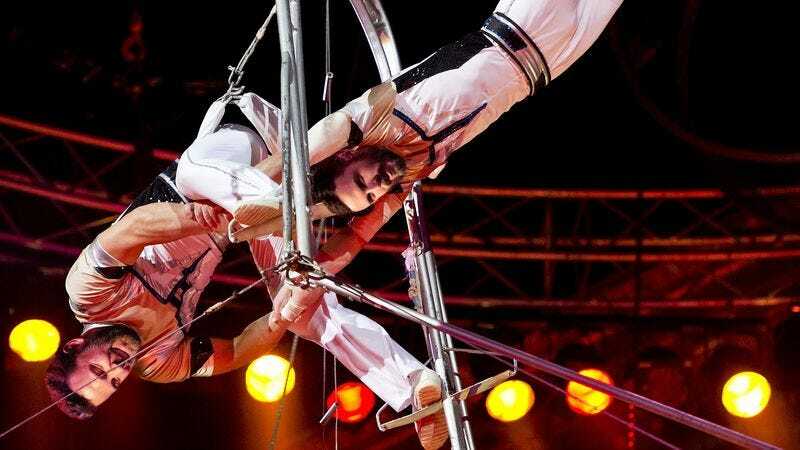 LOS ANGELES—In a thrilling display of death-defying acrobatics, the Amazing Affleck Brothers dazzled the Oscars audience Sunday night with a breathtaking high-flying trapeze routine. “Ladies and gentlemen, my brother Casey and I will be performing for you this evening with no safety net—only our aerial skills stand between us and certain death,” said a leotard-clad Ben Affleck, who caused the audience to collectively gasp as he leapt from a platform 50 feet above the Dolby Theatre stage, executed a triple somersault, and was caught upside-down in midair by the younger member of the flying duo. “And now our next acrobatic feat—you might have to make our Oscars posthumous after this one! Drumroll, please!” At press time, the Amazing Affleck Brothers were paying tribute to their late sibling Dylan, who died at last year’s Oscars ceremony during a human pyramid mishap.